His name is Artur Kurmakaev. A close-to-police media outlet Espresso claims that the man who attempted to kill Adam Osmayev in Kyiv is a St.Petersburg bandit Artur Kurmakaev. 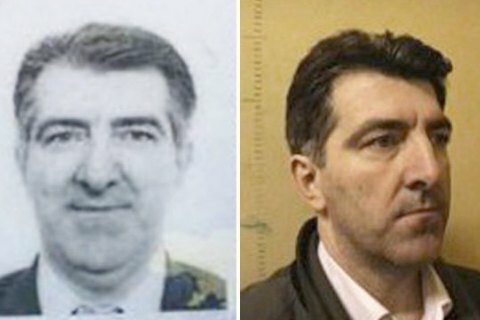 Espresso declined to disclose the source of this information, but the person in the photo in the passport of the detainee has a level of resemblance with the archive photos of Kurmakaev. Artur Kurmakaev (aka Krinari, aka Denysultanov, aka Tishchenko, aka Tsebro) has been known in Russian criminal world as Dingo. The St. h Petersbourg publication Fontanka in 2011 reported that the Odintsovo City Court has sentenced him to eight years in prison after an attempted theft of over 7mn rubles and coercion to give false testimony. In the 90s, was repeatedly arrested on charges of fraud, the use of forged documents, an attempt on the life of a police officer and kidnapping both in Russia and abroad. Born Denisultanov, Kurmakaev took this surname in 2001 after he married the sister of a Gatchina businessman, Kiyam Kurmakaev. In the 00's, Kurmakaev's name surfaced in Austria, where he gave evidence to the Austrian police in the case of the murder of Viena resident Umar Israilov, a former Chechen militant and Ramzan Kadyrov's security guard. In the spring of 2008 Kurmakaev gave evidence to Austrian law enforcers and applied for asylum in Austria, but was soon deported for the violations of migration legislation. Israilov was killed in broad daylight in front of a supermarket in a residential area. Vienna police decided that killer was some Lecha Bogatyrev, who managed to flee Austria. The killer who attempted to shoot Osmaev in Kyiv on Thursday, held a Ukrainian passport issued in the name of Oleksandr Dakar.